Amherst Student covered the growth of HSTEM course in one of its November issues. It covered our growth from the first course in Spring 2016, to the Fall 2017 course, also acknowledging the growth of the HSTEM community across the STEM departments at Amherst. "...the significance of the “Being Human in STEM” initiative, saying it has opened a vital conversation on whether it is appropriate to bring elements of one’s identity into discussions of STEM." "'It’s been a really incredible thing to see, you know, the faculty come together and organize that [curricular incorporation] piece of it,' said Lyster." The Amherst Student issue 146-25 wrote about the Being Human in STEM course at Amherst! The writer, Mark Simonitis, Amherst College Class of 2019, conducted interviews with two of the pioneer students: Emma Ryan and Ashley Bohan. On Dec. 9, 2016, Yale News covered Yale's HSTEM Course. “One of the big things that I’ve felt like I’ve learned, being a woman of color in STEM at Yale, is that my experiences are not isolated,” Joyce Guo ’17, a physics and English double major, said. “The more we talk about things as a group — ‘oh hey, it happened to you too’ — the more you communicate your experiences with others, the more you can pin down what makes you feel uncomfortable in a scenario and the more you can fix it for next time. “What we learned from Amherst and what [the students] have been putting together here is there’s real data out there showing that interventions really do work, at the student level and the faculty level,” Miranker said. “We want to take them down the path of being real and meaningful and — because we’re STEM — meaning measurable tools and effects." ​In response to these conversations, Amherst chemistry professor Sheila Jaswal spearheaded the creation of a “Being Human in STEM” class the following semester. It was also featured in UW-Madison's STEM Diversity Network page here. On November 4th, 2016, we had the amazing opportunity to attend the Transforming Undergraduate STEM Education Conference in Boston. At this conference many professors and administrators from around the country came together to present the research they have done on the subject of diversity in STEM. This information ranged from understanding the current environment at their institutions, what resources are available, what programs have been implemented and how they are working and so on. This three-day event consisted of poster sessions and workshops where individuals were able to have conversations with the attendees in the hopes of networking and continuing these conversations back in their institutions. Even though we weren’t able to present the work that we have done over the course of the year, we were able to attend on the second day which was when the majority of the poster session occurred. To make the most of our limited time at the conference, we reached out to several presenters in advance to arrange opportunities to meet with them. We had two goals in mind. First, we wanted to see what work is already being done at other campuses that can contribute to our own Being Human in STEM initiative. We wanted to do this because the work that we are doing is a relatively new subject which consequently means that not that much research and information is available to us. This also means that new information is coming out every day. Our second goal was to expand out network in the hopes of receiving feedback on the work we began doing this semester and hope to continue in Spring 2017. The conference itself was very interesting. It was refreshing to see that there are so many individuals that are striving to improve the condition of STEM in higher education and trying to understand the implications of having a more diverse demographic. There was a lot of different information that was valuable, especially those that broke down why it is vital to have these conversations on campus. However, there are certain things that can potentially make the conference more successful in my opinion. My main criticism of the conference was the lack of student involvement in the conversations that were being held. Emma and I were only two of a small handful of students amongst the throng of hundreds of well-meaning faculty and administrators. More than a few times, Emma and I were bombarded with questions asking for our opinions, which deterred from my own experience because the focus was redirected to us instead of the work being presented. I don’t believe their curiosity and questioning were bad, I just feel that had there been more students the feedback would have happened more organically. Additionally, I am a strong believer of the importance of including student voice in this research. I am grateful to the leaders of Being Human in STEM for basing this course on the student perspective from the very beginning. In my opinion this is what has allowed our own work to be successful because there is a direct connection to the audiences we want to reach. This is why I felt a bit uncomfortable at some of the presentations because, though stemming from good intentions, those presenting their work were speaking for students without really knowing how students would react. A lot of solutions were hypothetical next steps that were based on numbers rather than experience. A solution for this is to open up the conference for students to attend. That way the student voice, which is the most important in my honest opinion, will be more present and integrated into the conversations. Overall, a very insightful and inspiring conference. As a student I want to see it be successful because the work that is being done is extremely important. I have learned so much while attending and was able to speak to incredible scholars that provided great insight to our own work. Hopefully moving forward, we can all grow and continue to strive for a more inclusive STEM world. ​Hello visitors and welcome to Being Human in STEM Version 2.0! A few of last semester’s students (Ashley, Ruth, and myself) have returned this year to continue our work under the guidance of Dr. Jaswal. After the success of sharing our interview project at Amherst Explorations, Yale DiversiTea, and a final CHI salon last year, we’re prepared to maintain our momentum by focusing it in a slightly different direction. As Ruth, Ashley, Dr. J. and I brainstormed in early September about how to meaningfully carry our project forward, we thought back to the reactions of students, staff, and faculty who came to learn about our work. The questions and comments we received tended to center around one theme: What can I do differently? Thus, for the Fall 2016 semester, we’ve decided to concentrate on forming a Diversity in STEM Tool-Kit specifically catered towards professors. Consisting of five modules, our product will aim to provide concrete, usable tools for working with students to understand and foster STEM inclusion. As you may note from the lack of specifics, we’re still in the nascent phases of this project. We hope to acquire as much feedback as possible as our work progresses, so don’t hesitate to reach out if you’d like to offer input along the way - click on the ‘Share Your Story’ link or email one of us via our information on the ‘About Us’ page. Or, if you’d prefer to observe from afar, stay tuned to this blog for periodic updates on our progress. We hope this letter finds you well. 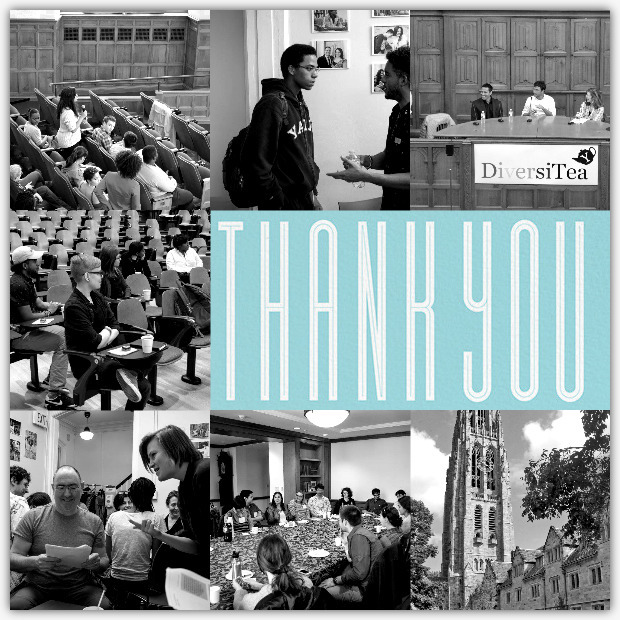 We wanted to thank you so much for coming to speak at our DiversiTea event at Yale. We are incredibly grateful for the time you took to visit New Haven and the honesty and care you put into all of your discussions with us and the other students. It was an inspiring moment of cross-collegiate unity in a joint mission to promote diversity within the STEM fields and to make the STEM environment more welcoming to all students. It also provided us with a valuable look into the Amherst College environment and the ways that we can make our own college environment similarly welcoming. Because of your visit our Physics Department has started its own course called Being Human in STEM, modeled on the course you and your students created. You’ve not only helped to spark meaningful discussions but you’ve also helped us to enact real change in our STEM classes. DiversiTea is in its inaugural year and it is an organization at Yale that bridges the undergraduates, the graduate students, faculty, and staff in its mission to promote diversity within the STEM fields. As such we also wanted to thank you for inspiring us with your own dedication to issues of diversity within your STEM career, both in the classroom and in the lab. Thanks again for coming to speak with us and for helping us improve our own Yale STEM environment. Hello Everyone! My name is Felix German Contreras-Castro, a Black Studies Major with a Pre-Med focus at Amherst College. I will be sharing my experience at Yale’s ﻿﻿DiversTea﻿﻿ – a daylong event promoting diversity and inclusion in the STEM field. I’ll start off with the wonderful ride I shared with Dr. Jaswal to New Haven. 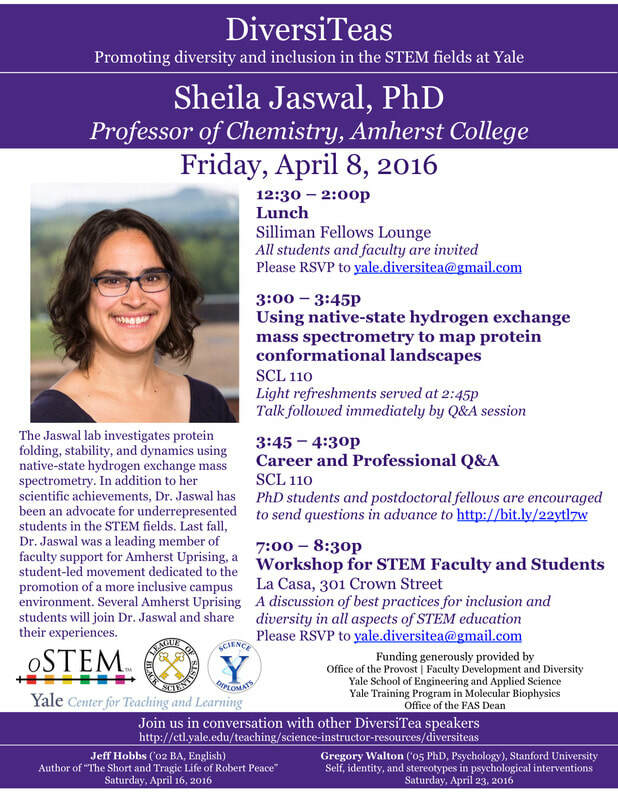 Before arriving to Amherst College (Community College Transfer Student), I had never met a STEM professor of color. As we drove to CT, I clearly saw the importance of having mentors that share similar backgrounds. Dr. Jaswal is in a special position for students like myself. As a Queer Woman of Color in STEM, one can only imagine the many obstacles she surmounted. Her plethora of experiences allows her to present genuine and thoughtful advice that a Queer Black Man can apply to his life. As we arrived to New Haven, we were greeted by Yale students and went straight to business. I was not surprised that Yale’s STEM dilemma is similar to ours in Amherst. My experiences at Amherst have been very challenging, and at times discouraging, which seems to have resonated well with Yale students. In sum, Students of Color—especially from disadvantaged backgrounds—are left behind in STEM. There is not one objective solution because it varies from student to student. My experience is not unusual. I had no idea what I was getting myself into when I registered for physics at Amherst College. I was perplexed by how an introductory course could be taught with such haste. Furthermore, it is disheartening to know that many of my colleagues found this course to be a review. This explains the unexpected lightning pace of the course. My performance forced me to withdraw and reconsider an alternative path to medicine. Yale students’ continuous head nods hinted that they too have faced this sort of challenge. Accepting failure after giving it your all can force anyone to an alternative career path. We have to have been the brightest of the bunch to gain admittance to institutions like Amherst and Yale. Institutions like Amherst and Yale have the audacity to boast on their diverse student body, but fail to provide the services for such a vibrant community. Not all of us hail from affluent families that can provide a rich preparatory education for elite colleges. I have depended on Google for the majority of my life as I sat in my family’s living room studying for hours while juggling jobs, and extra-curriculars, with no mentorship or guidance. There are few points that I would love my reader to take away from this blog. First, STEM is field where cultural understanding must be included in order to have the vibrant diversity we aim for. Second, students from disadvantaged backgrounds—especially in elite colleges—want to do well in STEM…many of us just do not know how. Third, if a professor gives up on a student, there is high probability the student will give up on himself or herself. Lastly, everyone has the potential to be a STEM person. If you do not believe this notion than you are part of the problem why so many students from disadvantaged backgrounds opt out of STEM. Look for us at the "Women of Color STEM Entrepreneurship Conference" in Arizona! This year’s theme is The New Normal: Women of Color Innovations and Achievements through STEM Entrepreneurship, with guest speakers Dr. Aprille Ericsson-Jackson a NASA Aerospace Engineer, Sandra Begay-Campbell from Indian Energy Program Lead and Sandia National Laboratories, Angeles Valenciano the CEO of the National Diversity Council, Sharon M. Wong who is the Acting Director of Office of Personnel Management’s Office of Diversity & Inclusion, and Jaime Casap the Chief Education Evangelist at Google. The conference will be made up of speakers, workshops, and networking opportunities and is open to anyone with a passion in advocating for opportunities for women and girls of color in STEM and entrepreneurship opportunities. We will be conducting video interviews capturing the story of resilience and persistence of these successful women of color through the STEM pipeline. These will eventually be accessible on our website to provide inspiration and role models for those at various stages in STEM.